In 1946, William Bullitt, the first U.S. Ambassador to the Soviet Union, U.S. Ambassador to France at the outbreak of the Second World War, and onetime close advisor to FDR, wrote the first book-length, comprehensive analysis of the emerging Cold War between the United States and the Soviet Union. During the war, as the book's new introduction by Francis P. Sempa points out, Bullitt had repeatedly urged President Roosevelt to wage war with a view toward the postwar balance of power. 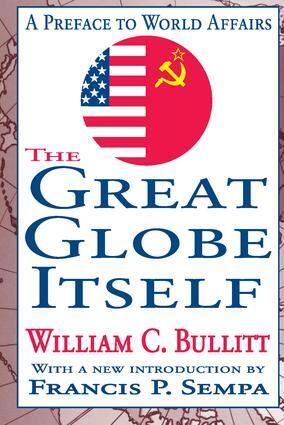 Bullitt recounted in this volume how the United States missed opportunities to block Soviet geopolitical gains during the war due to a fundamental misreading of the nature of the Soviet political system.Bullitt wrote The Great Globe Itself from the perspective of a key advisor to President Roosevelt who evolved into a strident critic of the president's wartime diplomacy toward the Soviet Union. When Soviet Russia became a wartime ally of the United States, Bullitt understood that the alliance would last only until the common enemy (Hitler's Germany) was defeated.Bullitt's discussion and analysis of fundamental global geopolitical realities and his prudent counsel to couple diplomacy with force in international relations are as relevant today as when he wrote the book, nearly sixty years ago.